Rare pairing of early period c1930s Robert (Mouseman) Thompson, extremely weathered oak, shaped garden table and dug out style tub chair. Unusual items - first time we have seen this design chair. 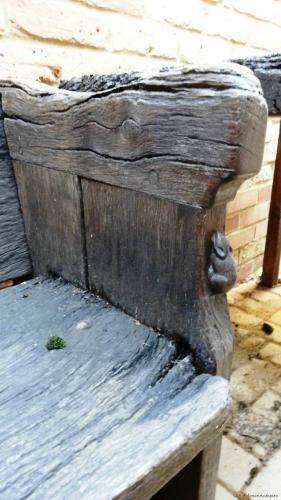 Both with their carved mouse signature - up one leg re the table and on left front upright side on chair. Table approx 43" widest, 23" deepest and 28" high. Dug out chair approx 24" wide, 20" depth and 26" high.